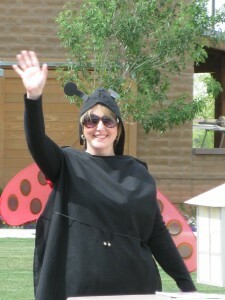 Last week, 100,000 lady bugs moved into Vistancia, Arizona. It was (of course) the annual Ladybug Release, organized by CCMC. Students from Vistancia Elementary School pitched in to spread the little critters over turf, plants and flowers. But do you know how this tradition came to be? The idea started back in 2003, when aphids were invading Power Ranch, Arizona. Then lifestyle director, Kathy Clark, collaborated with her community manager to turn the problem into an opportunity to partner with the local elementary school and release thousands of ladybugs into the air. The ladybugs were a natural way to combat the aphids. Now, more than a decade later, this annual tradition is treasured across the country by many CCMC-managed communities. Now, that’s an innovative solution! CLICK HERE to see the video coverage from the local Fox affiliate originally broadcast on April 8, 2014.